To play the sound from your presentation, you can connect the projector to external self-powered speakers. You can control the volume using the projector's remote control. Warning: Do not connect headphones to the projector; the excessive sound pressure may damage your hearing. 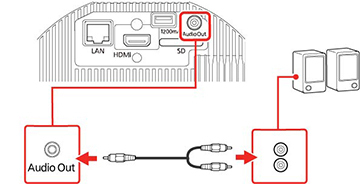 Make sure your computer or video source is connected to the projector with an HDMI cable.